Shield: Per pale argent and sable, a bridge of three arches, the center one broken, flanked by two towers, counterchanged. On a canton embattled azure, a cross pattee of the first (for the 17th Infantry), all within a bordure per pale sable and agent. Crest: On a wreath of the colors argent and sable an eagle displayed wings inverted head to sinister on a thunderbolt or. 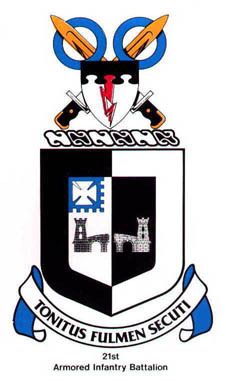 Description: The black and white border denotes the unit’s descent from the 55th Armored Infantry Regiment. That which is with in the border is from the coat if arms of the 55th Armored Infantry Regiment which had as its parent unit the 55th Infantry Regiment of World War I. See description of the 55th Armored Infantry Battalion for explanation.